This page provides information about Spinach nutrition. This edible plant is known as a power food in nutritional circles because of the very large amount of essential nutrients that it is known to contain. There are two major varieties of this leaf vegetable that are commonly available: these being the flat or smooth leaf type; and the curly leaf or Savoy variety. The former variety is usually used in raw foods due to the fact that it does not have a very strong flavor. There is also a hybrid variety of spinach known as semi-savory. In the past spinach (Spinacia oleracea) was classified in the Chinopodiaceae family of plants. Following reclassification in 2003 this genus was merged with the Amaranthaceae (amaranth) family. The plant itself is an annual that usually reaches a height of about one foot (30 cm) and is a native of South West and Central Asia. Although the plant produces inconspicuous yellowy green flowers the plant is grown for its edible green ovate leaves; these can be very variable in size ranging from under one inch (2.5 cm) and up to one foot (30 cm) in length. It is thought that spinach was first grown in the Iranian area and transferred to other parts of the world by Arab camel traders. It is known to have reached China by the early seventh century. Spreading in the other direction there is recorded evidence that spinach was used as a vegetable in the Mediterranean area by the early ninth century. The spinach name itself came about in the 14th century and derives from the Iranian word aspanakh (green hand). Spinach has a rightful reputation as being a very healthy vegetable to eat. It is known to be packed full of nutrients and is low in calories and fats. Perhaps one of the minerals that it is most associated with its iron; this is because of the popular cartoon show Popeye. 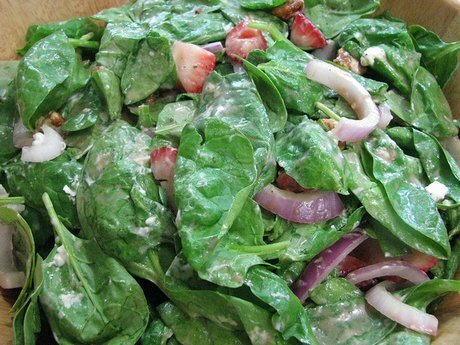 100g of spinach is enough to provide 25% of the average person’s daily intake of iron. Other spinach nutrition benefits include a large amount of vitamin K (one hundred grams provides over 400% of the daily recommendations of this vitamin); and vitamin A (100g = >300% RDA). Other abundant vitamins in spinach include Folate; Vitamin C; Vitamin E; Riboflavin; B6; Niacin and Thiamin. Spinach is also a large source of many minerals such as calcium, potassium, magnesium and zinc. Further details of spinach nutrition are given in the table below. As the nutritional value of cooked and raw spinach changes dramatically, information is provided for both of these situations. As spinach contains a large quantity of vitamins, minerals and other nutrients it is known as being one of the powerhouse vegetables of the food world. It is therefore no wonder that the consumption of spinach has been linked with having numerous health benefits. Some of the conditions that spinach has been proven to have a positive impact on include anti-inflammatory capabilities, blood pressure, vision, the immune system, bone strength and osteoporosis, stroke, nervous system, and the skin. As Spinach carries a large amount of anti-oxidants (e.g. Vitamin E and C, manganese) consumption can help to lower damage caused by free radicals. The presence of the flavanoid group of anti-oxidants is thought to have very large anti-cancer benefits. With regards to vision this leaf vegetable contains both Lutein and zeaxanthin; both of these carotenoids are known to play a very important role in the retina and macula regions of the eye. Vitamin K, along with calcium, magnesium, manganese and vitamin D is known to play a very important role with bone health. It is thought that the consumption of these vitamins and minerals on a regular basis, combined with weight bearing exercises such as walking, Tai chi and gardening can go a long way towards the prevention of the osteoporosis condition. There are numerous recipes that include spinach in them. They make a great raw ingredient for salads and they also make a great addition to lasagna and pizza; can be used in soups; is often served in a pureed form; good in curry; makes delicious smoothies; and makes a fantastic dipping sauce. When cooking spinach it is usual to boil it as this removes most of the sour tasting acids that the vegetable are rich in; resulting in a much sweeter taste. Discard the water that the spinach is cooked in after use as it is very acidic and has little use. Although Spinach is linked with many positive health impacts there are some negative aspects associated with the consumption of this leaf vegetable. Perhaps the major negative aspect of spinach is that associated with the risk of pesticides; it is known as one of the twelve foods that has the highest amount of residual pesticide. Therefore it is important to wash the spinach thoroughly before use, or better still purchase organically grown spinach if at all possible. Another key concern of spinach consumption is the large amount of oxalates that they concern. If these are over consumed it is possible for them to build up and crystallize in the body; this may lead to health implications especially for people with renal problems. It is usually recommended that people who have problems with their kidneys do not eat this vegetable. There has been much made of oxalates ability to interfere with calcium absorption. Although the levels of oxalates found in spinach have a negative impact it is important to remember that this mineral is found at large quantities in spinach too. This means that there is still a net absorption of spinach (around 10% of total quantity) when eating this vegetable. It has been seen that Spinach is an annual plant that originated from the Persian area and was dispersed to other areas by tradesmen in the 7th century. The amount of nutrients in spinach is extremely high and the consumption of this leaf vegetable is associated with many potential health benefits. Utah State University Extension; Colorado State University Extension; Nutritional information; Texas A&U; Flavanoids; Eating Well; Osteoporosis; Phytonutrients. 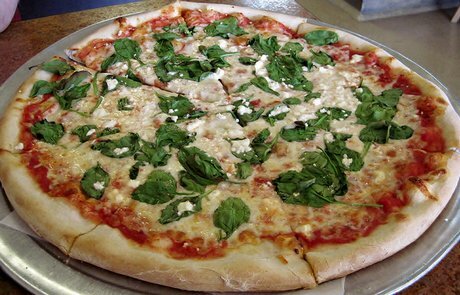 Photographs: Header by Woodleywonderworks; Spinach Pizza by SaucyGlo; Spinach Salad by Natalie Maynor.